In 2014, the National Survey on Drug Use and Health (NSDUH) reported that 17 million Americans (aged 12 and older) suffered from an alcohol use disorder. The good news is that treatment works. A third of the people who seek help and obtain treatment for alcoholism are symptom-free after a year. In addition, treatment can lower the risks for continuing problems related to alcohol, the National Institute on Alcohol Abuse and Alcoholism (NIAAA) publishes. Alcoholics Anonymous (AA) is an international organization with over 115,000 groups in 170 different countries and more than 2 million members globally, the National Council on Alcoholism and Drug Dependence (NCADD) estimates. A self-help and community-based program, AA is open to people of all ages, races, religions, cultures, social status, and genders. It is nonprofessional organization. Though it is a faith-based group, Alcoholics Anonymous is not affiliated with any particular religion or denomination; it is simply spiritual in nature. The Journal of Addictive Disorders published that although it may be difficult to quantify how well a program such as AA works at helping people achieve and maintain sobriety, people who regularly attend AA meetings are more likely to remain abstinent than those who don’t attend. 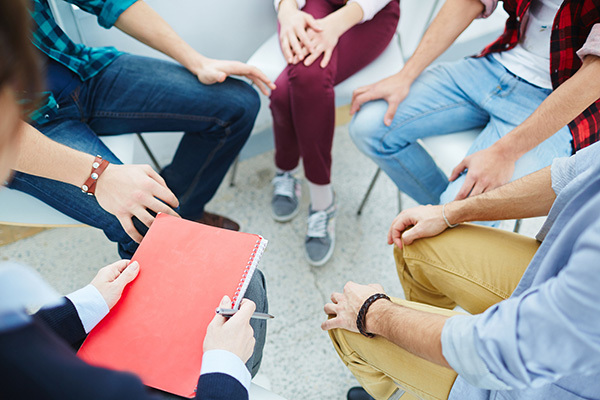 Support groups can enhance recovery, and individuals who participate are more likely to refrain from abusing substances, according to the Journal of Substance Abuse Treatment. Alcoholics Anonymous follows the 12-Step format with 12 traditions, often called the “12 and 12,” and individuals are encouraged to work through these steps in a group environment. The 12 Traditions highlight the anonymity of its members; the importance of group consciousness; the influence of a spiritual being or higher power as the true leader of the group; and the importance of being a nonprofessional group that strives to bring other people struggling with alcohol into the fold. The only requirement for joining AA is that a person has a desire to quit drinking. Each group is run as a separate entity that is financially self-sufficient. It does not cost anything to join AA or attend meetings; however, a collection plate is passed around at meetings, and attendees are encouraged to make donations if they are able. AA meetings are welcoming and informal, and they may be held at a multitude of different locations. Meetings are usually about an hour in length, and individuals do not have to join or be a member to attend. Meetings designated as “open” are for anyone to attend while “closed” meetings are reserved for those struggling with alcohol addiction directly. Meetings generally start with a welcome, and attendees may recite the Serenity Prayer or read from the Big Book. The “leader” or chairperson of the group reminds participants of the importance of anonymity and that anything heard within the confines of the meeting is not to be shared outside of the meeting. Individuals may then choose to share their experiences with the group, although no one is required to do so. At some point, a collection plate is passed around for donations, and there is usually time for coffee and socializing as well. Upon closing, a prayer may be said, or the leader may call for a moment of silence. The intention of an AA meeting is to provide fellowship and group unity with deference to a higher power. Each group may operate a little differently in order to cater to its members’ collective needs or wants. Discussion: This is the general format meetings follow, wherein individuals share and the group then discusses what has been shared. Speaker: A person is chosen beforehand to speak on a particular topic. Big Book or “12 and 12” Study Meetings: These meetings follow a more structured format, working through the 12 Steps, 12 Traditions, or the Big Book. Local groups may have different or additional meeting formats. Some AA groups are gender-specific, cater to a certain age demographic, or are for special populations. These meetings are usually designated as such. Alcoholics Anonymous strives to help its members become and remain completely abstinent from alcohol and mind-altering substances by relinquishing control to a higher power and accepting that only through a spiritual awakening will they find the power to change. Group fellowship and a sense of belonging are offered to individuals who may have felt isolated and socially withdrawn as a result of alcohol abuse and new sobriety. This social environment can enhance a person’s communication and relationship skills while also giving them the necessary support to recover. Relapse, or a return to alcohol abuse after a length of time without drinking, is relatively common in recovery and considered a part of the disease of addiction. The National Institute on Drug Abuse (NIDA) reports that between 40 and 60 percent of individuals battling addiction will suffer a relapse at some point. Support groups can provide tools to manage potential triggers as they arise, thereby potentially reducing and minimizing episodes of relapse. Individuals participating in A.A., as published by a study in The American Journal on Addictions/ American Academy of Psychiatrics in Alcoholism and Addictions, were found to have higher levels of self-security and self-esteem after working through all 12 Steps. Completion of the steps can be very fulfilling and help individuals to find spiritual balance that may provide a high level of mental strength and clarity. Positive peer pressure can be a driving influence for remaining sober. AA members are often paired up with a “sponsor” whom they can call at any time. Sponsors can help sponsees deal with stressors or manage cravings immediately when they arise. Building a positive support network is an important aspect of recovery. By surrounding members with others who can empathize and understand, AA can be a lifeline to those in recovery. AA meetings are offered at many different times to accommodate a variety of schedules. The AA website lists local resources to contact for information on a particular group or region, and this is a good starting point to find a local AA meeting. Each region may have their own affiliate AA assembly, such as the Southern California Area 05 or the Southern California Area Assembly (SCAA), which provides information on local meetings, group types, locations, and times, as well as contact information for specific groups. Primary care providers, mental health professionals, and substance abuse treatment providers can also help individuals find local meetings. In order to attend an AA meeting, all a person has to do is have a desire to stop drinking and show up. There is no intake interview, assessment, or paperwork to fill out, and there is no obligation to join if you attend a meeting. Attendance is kept confidential, and individuals can choose to go to as many or as few meetings as they wish. As each group is run independently, it may be beneficial to attend a few different group meetings in order to get the feel for them and decide which one may seem like the best fit. Some individuals may prefer a specific type of group, such as a women-only group or a mixed gender group. AA groups also exist for spouses, children, family members, and loved ones who are affected by alcoholism or addiction. With so many different types of groups and meetings to choose from, there is bound to be one nearby that can help you or your loved one maintain sobriety.